In honor of Earth Day coming up this weekend, treat yourself to a tiny terrarium to remind you how small our world is every day of the year. These Twig Terrariums even come complete with little figurines who inhabit the space. Le Petit Singularite DIY Kit (shown above) comes attractively packaged with all the ingredients needed to create your own little green world. The 40% recycled glass bottle’s shape creates a perfect viewing area and is sure to draw attention. Yep, it's all in there, including a female terrarium dweller! 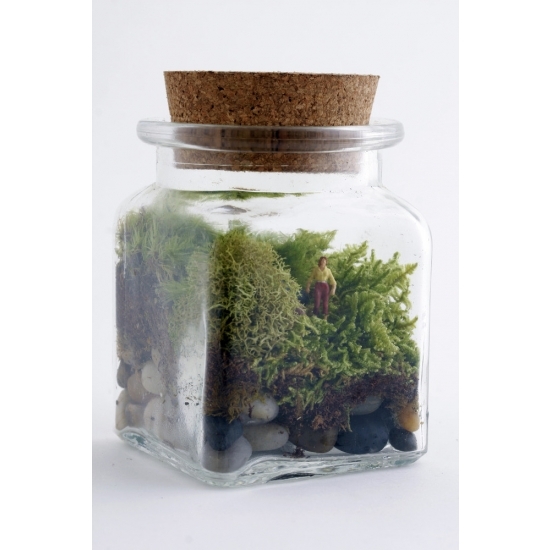 Here's the entire collection of Twig Terrariums to choose from. I love the gorgeous image above, of the view of the inside of the "Masterpiece" terrarium.